There are two apps that I use on an almost-weekly basis that I've been using for a while now (that I also rather love), so I thought now would be a good time to write up a little how-to post to help any of you that are interested in using either of them! Apps like these are another reason I'm so grateful I finally upgraded my phone to something fancy. They both consistently save (and sometimes earn) me enough money that I definitely find them worthwhile. It's not like it's a huge amount by any means, but as they say, every little bit counts—especially when you're saving money on things you consistently buy and were going to spend money on anyway. In the 5+ months I've been using Ibotta, I have earned $52. That's not too bad, considering it's not something I'm constantly using. In short, Ibotta gives you cash rebates when you purchase featured items at your favorite stores—from CVS to Target to Costco (and more). You select the product you would like the rebate for, complete some sort of task (poll, reading a small tip or recipe, posting to social media, etc.) and then the rebate is listed under your account. Once you purchase the item, you take a photo of your receipt (the app helps you do this) and scan the product. After Ibotta has confirms your purchase, they add the rebate to your account and you go on your merry little way. This app has changed a lot in the six months I've been using it. I found myself not benefiting from it soon after downloading it—mostly because often times the featured items weren't things I was going to buy. However, they've started offered many rebates that are for any brand products. Orange juice, bread, cereal, laundry detergent…all things I'm buying anyway, and they don't have to be a specific brand! They have been offering a weekly .50 any brand milk rebate—which is fantastic, because when do you ever find coupons for milk? — You have several ways of "cashing out" your earnings. I prefer Paypal (once you have $5 you can cash out) because then it's basically money in my pocket. But they have recently added options such as Starbucks gift cards ($5 minimum) and even Redbox movie rentals (only $2 minimum). The other day Jay and I had a movie night thanks to Ibotta, which is always a good time. — Because Ibotta is processed separate from coupons, you can get a rebate for an item you've already used a manufacturers coupon on. For instance, this week I got a container of So Delicious coconut milk creamer (trying to be healthy, yo) for $2.50. I had a $1 off coupon that I used in-store, then received an additional $1 back from Ibotta. So, the creamer was only $0.50! — Do you see a lot of movies? If so, please stop because you're making me jealous. But also: There is now an option to receive rebates (typically $1) for certain movies when you see them in the theatre. — The Ibotta referral program has recently changed, and you can now earn $5 for each person you refer, once they complete their first rebate. If you have a large social network, this can be an amazing deal. They currently have a special offer for new users, which gives you a $2 bonus when you sign up and complete your first rebate within 10 days. Here's where you can sign up if you're interested! I think that this app is definitely worth the download—even if you're only using it a few times a month and can manage to get a few referrals under your belt, that's free money right there! Right? Right. Oh, Target. How you whisper sweet nothings in my ear as I gaze upon your weekly ad every Sunday. And this app makes me want to buy the whole store. BUT! That's not the point of this. The point is to save money (and buy cute things from the dollar bins, because you can totally rationalize that). Basically, if you shop at Target, you need to have the Cartwheel app. You are able to add exclusive discounts to a barcode within the app, which the cashier will scan before you pay at the register. They have discounts on everything. They have the offers available to browse by category, and also within collections. My favorite one is the Weekly Ad Double Dip collection, which shows additional discounts you can get on items that are already on sale that week. — Again, since this is considered separate from manufacturers coupons, you can use this app in addition to manufacturer coupons and Target coupons. There have been times I've been able to get diapers for ridiculously cheap because I used all (yes, all!) of the following on one purchase: manufacturer coupons for each package of diapers, Target coupons for each package of diapers, and Cartwheel discount—also receiving gift cards for money back with my purchase. It hurts my brain to figure out how to organize it sometimes, but when you are able to save that much on something like diapers, it's quite worth the hassle! — They sometimes have one-day-only or limited-time offers with especially high discounts. In November, the Disney Princess dresses had a Cartwheel offer for 50% off (and they were already on sale at the store). I scored a Snow White dress for only $10, which I'm saving for her 3rd birthday. I was happy dancing all over the place, believe you me. Also, this week I was able to get yoga pants (don't judge me) for just over $7—when they retailed at $14.99. Again with the happy dancing! — Since they have so many offers at one time, I feel like more times than not I've been able to add a Cartwheel offer or two before checking out at the register. It's always worth it to do a quick check, because you never know if you can get an extra 25% off the spaghetti or socks or sewing machine (is there anything you can't get at Target?) you have in your cart. If you find it too hard to keep track of the deal match-ups on your own, The Krazy Coupon Lady has a section for Target deals right over here. It takes all the guess work out of the whole thing. At this point in time, these are the only two money-saving apps that I consistently use. I also have the Vons app that I use to add things to my card while I'm in the store (such a huge help! ), but there aren't any others that I've heard much about. Are there any I'm missing? Do share! Kerri, thank you so much for introducing me to ibotta! It's so great! I've been meaning to cut back my starbucks addiction money and this helps a lot. I think I've reloaded my card only once in the last 3 months. I haven't tried Cartwheel yet. But I'm off to the AppStore to download it and give it a go. I love Cartwheel so so much! I'd also download the Target app because they have a few mobile coupons in there that you can use in addition to Cartwheel, it's pretty great. Also, coupons.target.com . They have even different coupons and savings there. Basically I like saving money at Target because I spend so much money there, ha. Cartwheel is my favorite! I used to print out Target coupons but I wasted so much time/paper/ink and would only use one or two. 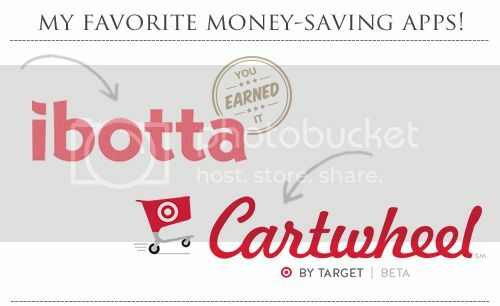 I've been only using Cartwheel and still save a lot. I absolutely love the range of discounts they offer because I feel like I save one everything I was already going to purchase. Have you tried Receipt Hog app? It requires no effort. Just snap a picture of your grocery receipts and they give you "coins" and "spins" and then you can cash out after 1000 coins for cash or Amazon cards. Ibotta was way to confusing/time consuming for me when I downloaded it a few months ago but maybe I should give it a go again. You should check out shopkick!